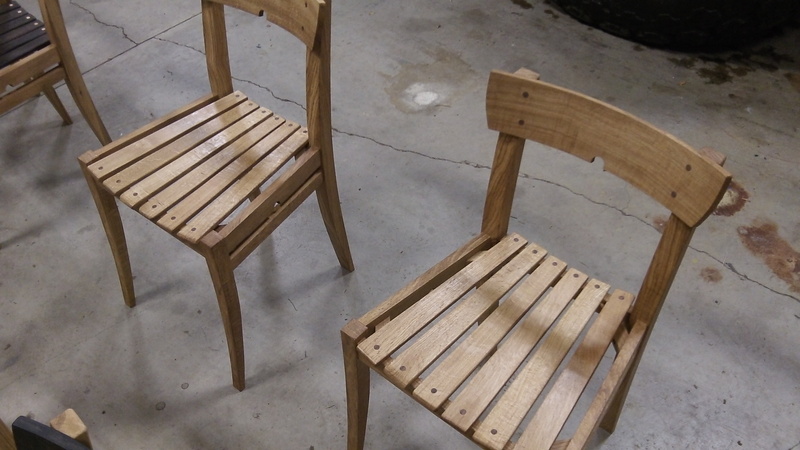 Oak chairs get more wax. From left are South Albany High School students Madison Wiseman, Karstan Peck and KaySea Hoffman. Looking for a handmade piece of furniture linked to Oregon’s natural history? Sunday is your chance to buy one — if you put in a winning bid on any of about two dozen pieces made from the wood of oaks that used to stand in Albany’s so-called Hackleman Grove. A year ago, students and other volunteers used portable sawmills to cut the logs into boards. And since then, woodworkers in the schools and elsewhere have turned them into furniture and items such as bowls, sometimes combining the Hackleman oak with other hardwoods such as maple and walnut. The results are for sale at the “Lumber for Legacy” auction, which starts at 5:30 p.m. Sunday (Nov. 9) at the Wheelhouse on Albany’s riverfront. Tickets are $20 and cover a light meal and a beverage. You can reserve yours by calling Albany Parks and Recreation at 541-917-7777. 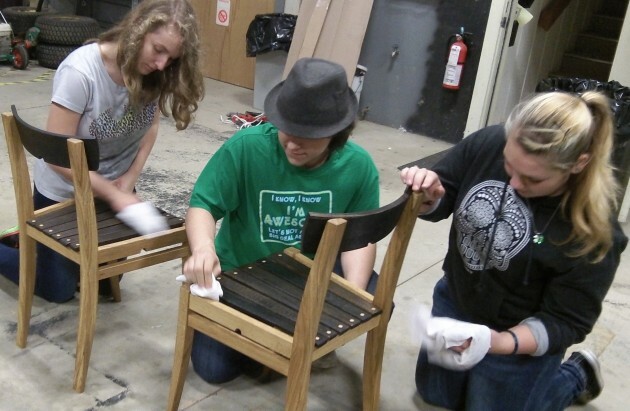 Proceeds will benefit “Sawing for Schools,” the program that makes donated lumber available to shop classes, and the restoration of white-oak habitat in Albany parks. Mark Azevedo, a member of the Albany Tree Commission and a driving force behind the Hackleman oak project, drew my attention to the benefit. On Monday night, I dropped in on the shop at Timber Linn Park, where he, other volunteers and three South Albany High students finished waxing a dozen cafe chairs made from Hackleman oak.